Since joining the Doris Community Cultural Center as an Artist in Residence, I have been working to promote their classes for youth and children. On March 9th I spent the morning at a local middle school telling parents about classes AND inviting kids to work on a group mosaic project. 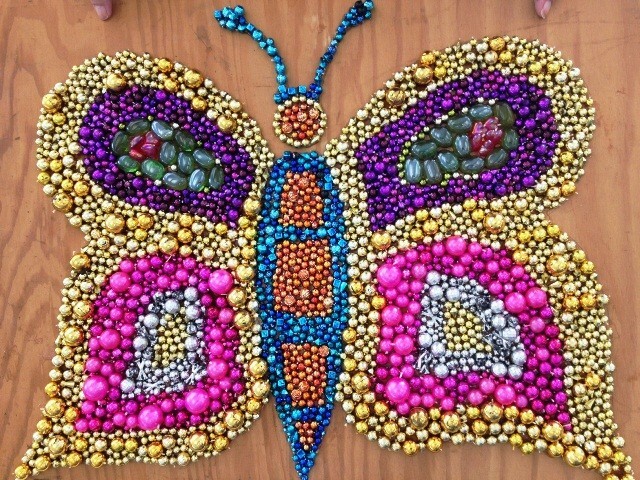 Here is a photo of the final mosaic, created using beads from old mardis gras necklaces. The project took about 4 hours, and was guided by mosaic artist Limor Ben-Naim Herb. We had a wonderful time! Interesting side story: when I brought the piece home for the night my kids just HAD to make a mosaic immediately, and since then we've been making butterflies, suns, flowers, stars...you name it! Funny thing is, my daughter is so very careful with her projects, placing each selected bead in a very specific spot. My son, on the other hand, just dumps a handful of beads on the glue and declares the project complete in less than 30 seconds. Just shows you, everyone has their own process, and each one is valid, satisfying, and enjoyable for the person who executes it.